Happy Monday! I had a great weekend filled with relaxing, celebrating an old family friend's engagement and Father's Day. Now I am recharged and ready to tackle the work week! Luckily, this week will be mostly filled with office days which is much needed after traveling last week. Time to play catchup with all my emails! Enough about me...you've come here for the food and I don't blame you! Just look at that delicious frittata! 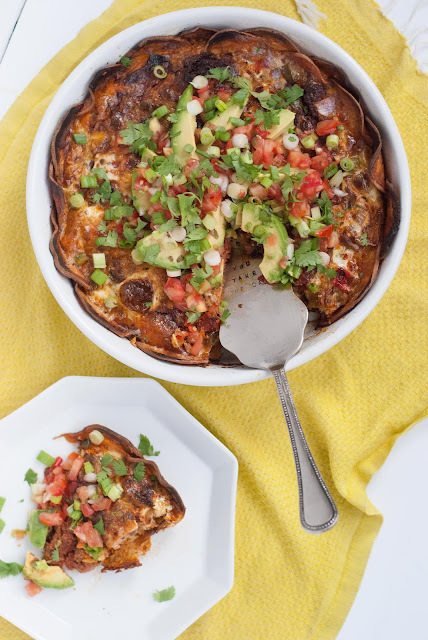 It is filled with peppers, green chilies, onion, chorizo and eggs that are all baked inside of a crispy sweet potato crust. Top it with avocado, green onions, pico de gallo and some fresh cilantro for the perfect breakfast or lunch! 2. Heat 1 TBS ghee in a large pan over medium heat. Once warm, add a layer of sweet potato rounds. Cook for 3 minutes on first side and then flip an cook an additional 2 minutes. Place on a paper towel lined plate and repeat with remaining rounds. 3. Once sweet potatoes are cooled, line a casserole dish with them (bottom and sides). Be sure to not leave any space between them. 4. Using the same pan, heat 1 TBS more of ghee. Add in the diced peppers and onion. Cook until translucent and then add to the casserole dish. 5. Next, cook the chorizo until broken apart. Add to the casserole dish. 6. In a medium bowl, whisk together the eggs and add salt and pepper to taste. Then, pour them on top of everything in the casserole dish. 7. Bake in the oven for 35-40 minutes or until the eggs are set. Let cool for 10 minutes and then slice up and enjoy!